I'll be honest here, I'm much more naturally acclimated to colder temps. I love crisp air and 60 degree highs. Nothing beats a cup of hot coffee on a cool morning. When the temps start to rise, I console my sweaty self with refreshing cold brew, which is probably my favorite thing about warmer weather. When brewed correctly, it's smooth, refreshing, and ridiculously addicting. The best part is, it's not hard to make! The earliest documented use of a RTD (ready-to-drink) coffee concentrate was Mazagran*, a French mixed beverage consisting of sweetened coffee concentrate and chilled water. It was first enjoyed by the French Foreign Legion soldiers at the Mazagran fortress in Algiers, who drank it chilled to combat the heat. 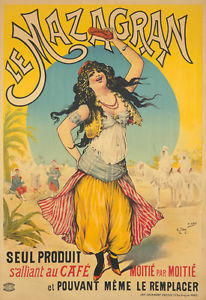 Subsequent versions of the drink began showing up in cafes in France after the soldiers returned to Paris as the cafe mazagran. *The original inspiration for the Starbucks and PepsiCo carbonated coffee that flopped in the early 90s, whose by-product brought about coffee extract used in the refrigerated bottled frappuccinos, double shot, and iced coffee beverages sold in grocery stores. The modern wave of cold brewed coffee concentrates seems to have originated with the introduction of the Toddy system, the cold brew method developed by Todd Simpson. As the story goes, Todd was in Guatemala when he ordered coffee at a cafe and was served a small carafe of cooled concentrate and a pitcher of boiling water. He found the mixture to be less acidic and decided to work on a formal brewing device. His son further marketed the device and the market for cold brew coffee grew. Coffee is essentially a solution of particles from the ground coffee bean dissolved in water. When brewing coffee with cold water, it is essential to point out that the resulting beverage will be very different than if brewed hot from a flavor perspective. This is due to solubility, or the ability of a substance to dissolve. Like sugar, coffee particles are far more soluble at higher temperatures (between 195-205 degrees Fahrenheit), especially those particles that contribute to the acidity (where the aromatics, floral and citrusy notes come from) and caffeine. Therefore, the cold brew will never be able to extract the same flavors and aromatics you would expect from a cup of coffee brewed hot. While some may say that means cold brew is inferior to coffee that is brewed hot, I submit that it simply makes cold brew different, with it's own unique set of advantages. The floral and citrusy notes and the aromatics are most notably affected by the staling process that begins after the beans are roasted and are noticeably lacking beyond 14 days from the roasting date. Since the cold brew method does not extract these in the first place, it is entirely unaffected by this phenomenon. I've used beans roasted more than a couple months prior to brewing with exceptional results. The second advantage of cold brew is it's longevity. Over time the acids, aromatics and oils that contribute to coffees flavor bond with oxygen increasing the pH level and making coffee bitter. This process, called oxidation, occurs much more readily at higher temperatures. In the cold brew method, the coffee is not exposed to heat and remains cooled keeping oxidation at bay and allowing the beverage to be stored for a much greater time after brewing, even up to 2 weeks or longer. The lack of acidic extraction also creates vastly different experience on the palate than coffee that is brewed hot. The experience from hot coffee is heavily influenced by the volatility of coffee, or its ability for its solvents to be turned into vapor and released into the air, an experience we describe as aromatics. Cold brew methods have virtually no volatility due to the lack of heat, shifting the experience of the flavor entirely to the tongue, uniquely highlighting notes from the chocolatey and nutty spectrum with an inherent sweetness. Instead of an acidic finish, cold brew leaves the palate with a smooth, clean finish that is highly refreshing. Due to these characteristics, I find that darker roasts result in a more pleasing cold brew than their lighter counterparts. Anyway, lets get to making this refreshing beverage. The actually process of making cold brew is very simple: Grind coffee, place in water, steep, and remove the grounds. There are a bunch of different ways to accomplish this, below is the method that I currently use, at the time of writing this. This method can be easily adapted to fit your needs, so this first list is very unspecific. Grab all of these through my Cold Brew list on Amazon! As stated above the roast date of the coffee matters less with cold brew, however, grinding freshly does matter so buy whole bean. For cold brew, I prefer dark roasts. I pre-weigh my water into the Chemex (no filter needed) which I found is easier than measuring directly into the steeping jar. I highly recommend using an electric grinder, I've used a hand grinder for this before, but grinding 234g takes a surprisingly long time. I've included my grinder of choice in the tools list. Add the ground coffee to the Madesco coffee filter. Pour the water over the grounds then mix gently to ensure the grounds are evenly saturated. I use the back of my Aeropress spoon, a wooden kitchen spoon would also work well. At this point you have two options. 1) Cut the resulting concentrate with water for a Ready To Drink cold brew or 2) put the concentrate in the fridge and cut as desired when serving. Option 2 would allow you to alter your mixture or mix with milk prior to serving. I rarely alter my mixture so I personally opt to cut immediate and store the RTD cold brew instead. To dispose of the coffee grounds, loop the opening of the Madesco coffee filter around the mouth of the jar and dump the grounds into garbage or store separately for use in your garden. Hand wash the filter with soap and water, rinse thoroughly, and air dry. And there you have it! My preferred method for my favorite summer coffee drink. What is your favorite summer coffee drink? Do you have a home cold brew recipe you'd like to share? Drop a comment below and as always, feel free to ask questions!